Using USB Security, network administrators can place an essential extra safeguard over their computers and networks. 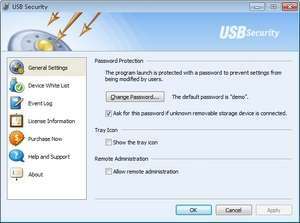 USB Security allows you to block off access to potentially harmful USB devices while white-listing other devices such as USB printers and input devices so you can otherwise continue to use the computers normally. With centralized installation and configuration, it makes this software download and ideal choice for USB security. For security reasons, you should also check out the USB Security download at LO4D.com which includes virus and malware tests. Additional screenshots of this application download may be available, too. USB Security has a presence on social networks.